Using “niches” feature will enable you to target your traffic, which should increase the productivity of surfers you send to your trade partners (external productivity) and consequently also your (internal) productivity. By default, when the skim selects a surfer to be sent to a trade instead of a gallery, all trades from the outgoing list are loaded. But this surfer might be searching for specific content and if you send him to a trade with different content, he will probably not produce many clicks. If some of your trades provide specific content you can assign them to niches and send surfers to those trades that match their interests. A niche is a mini version of the outgoing list, containing only the trades assigned to this niche. Trades assigned to a niche can only get traffic from links containing a niche parameter ''g='', unassigned trades can get traffic from any link. 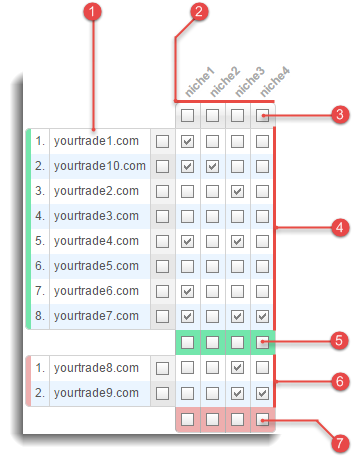 This is how traffic trade scripts usually distribute traffic: every time a click on a link containing a niche parameter g=niche1 is skimmed, the surfer gets sent to one of the trades assigned to niche1. In other words, “outgoing list” gets ignored and the respective surfer is sent to a trade based on the “mini ougoing list” for niche1. tradea.com is not assigned to any niche. It is sending you traffic and is placed on your “outgoing list” based on the Owed ratio. Your skimmed traffic is being distributed to niche-trades, although their Owed ratio is significantly lower than that of tradea.com. If you don't return traffic to tradea.com, trading with this trade will gradually decrease and eventually stop. This niche: “mini outgoing list” will include trades assigned to this niche only. When a surfer clicks a link containing a niche parameter g=, he will be sent to the most owed unvisited trade in this niche. This niche + unassigned (default setting): “mini outgoing list” will include trades assigned to this niche and active trades not assigned to any niche. When a surfer clicks a link containing a niche parameter g=, he will be sent to the most owed unvisited trade on the “mini outgoing list”. We believe that balanced and proportional traffic distribution is your best choice in the long run, and have designated This niche + unassigned as default setting. However, a lot of webmasters support a different trading philosophy - concentrate on perspective trades and targeted traffic. Both doctrines work and you should choose, which one suits your needs best. Reset and start over: after a surfer has visited all trades on the respective “mini outgoing list”, reset cookie information. The next skimmed click on a link containing a niche parameter g=, will send him to the most owed trade on the list. Send to other trades: after a surfer has visited all trades on the respective “mini outgoing list”, send him to other trades on your outgoing list. Send to gallery: after a surfer has visited all trades on the respective “mini outgoing list”, ignore skim and send 100% to content. The first skimmed click will send the surfer to the most owed unvisited trade in this niche. The second skimmed click will send him to the second most owed unvisited trade in this niche. When this surfer produces the third skimmed click TE3 will reset his cookie and the surfer will be sent to the most owed unvisited trade in this niche again. The third skimmed click by the surfer (and all subsequent skimmed clicks) will send him to other trades on your outgoing list. The first skimmed will send the surfer to the most owed unvisited trade on “mini outgoing list”. This trade will be removed from the list. The second skimmed click will send him to the second most owed unvisited trade on “mini outgoing list” etc. After he has visited all trades on the list, TE3 will reset his cookie and the surfer will be sent to the most owed unvisited trade on “mini outgoing list” again. The fifth skimmed by the surfer (and all subsequent skimmed clicks) will send him to other trades on your outgoing list. After the surfer has visited all trades assigned to myniche, all his subsequent clicks on links containing parameter g= will send him 100% to content (default skim will be ignored). To create a niche, switch to “Niches” menu, click on the Manage niches button and open “Manage niches” pop-up window. Click Add row to create a new niche. Click to delete selected record. The number of trades assigned to a niche. Successive number of the niche. Enter a niche name of your choice. Only use alphanumeric characters and -, _. Note, that niche names are case sensitive - g= parameter has to match Niche name exactly! Available options: This niche and This niche + unassigned active trades. Available options: Reset and start over, Send to other trades and Send to gallery. Each niche has one column. Assign all your active and inactive trades to a niche. List of your active trades (sorted alphabetically). Assign all your active trades to a niche. List of your inactive trades (sorted alphabetically). Assign all your inactive trades to a niche. Note, that you can assign each trade to one or more niches, or you can leave it unassigned.